A.DOR.A.BLE!!! « You know… that Blog? Lookie what I found as I was going through my reading list this morning! Is that not an adorable idea?! I totally have to try that. The thing I like about Bakerella’s creations is that they’re usually so easy even *I* could do it. Remember the burgers?! Keeps me coming back time after time. So of course I got thinking about how to turn these to my advantage. I’m thinking school lunches here, folks. My Wee One is such a busy bee at school that she rarely ever eats her lunch, and then she’s beside herself starving by the time she gets home. We all know what that entails – tears, the odd tantrum, exhaustion. Yeah. So how do I get this kid to actually eat? I often cut her food into sweet shapes with a canape cutter (the heart one is her fave) or small cookie cutter. That only works every so often though. Now I’m thinking Bakerella is on to something… bite size food on a skewer! 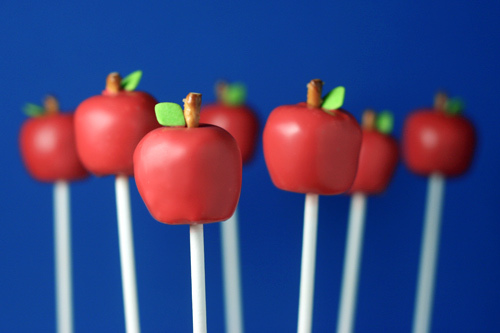 Well, lolly pop stick anyway – can’t be sending skewers to kindergarten after all. Seal it up with “Press n seal” (with a lip that she can easily grab to remove) and that might actually do the trick! What do you think? Do you have any suggestions for me?! Holy Freakin’ Cuteness!!!!!! I LOVE them…Just wonderful!!! And the ones with the faces on her site?? TOOO cute!!!! Well done!!! i’ve gotta go check that out!! thanks!! .-= cherie de castro´s last blog ..Macro Monday Entry =-. What a great idea! Is there a recipe that goes with the Superior Snap? .-= Mighty M Family´s last blog ..thank you… =-. You’re looking for ideas, right? My kids always liked to dip stuff — so a little tupperware-ish container of ranch dip or similar and a poky thing to dip stuff with (popsicle stick? lollipop stick?) made their hearts sing. Sometimes I also stuck a “secret message” at the bottom of the lunch box — seemed to make working one’s way through the lunch box more fun . . . .
You also have to realize that when they go off to school you completely lose control of their eating habits. Bummer, but there it is. .-= Liz in Virginia´s last blog ..London, London, London! =-. Oh, and you asked a while ago and I never answered: our twentieth anniversary was June 24. Seems like it was just a few months ago — but I am absolutely NOT getting old. Bakerella is so cool! Those are so adorable! .-= Caroline´s last blog ..Mosaic Monday – Wine Country =-. Cute indead, love the idea, cubes of cheese and apple are good, or grapes if you can manage without squishing them! I’m away for a week, I’ve done my homework though, oops meant I’ve done my Haiku! I put it in a schedules post for tomorrow but can you add my link for me cause I will be travelling, please? .-= Jade @ No Longer 25´s last blog ..Sun, Roses and Tapas =-. Thanks for stopping by my Chocolate Blues. Now I’m going over to check out Bakerellas. On the ‘short’ day we often would call it our ‘snack lunch day’… and we’d fill the boxes with cut up cheese and crackers, apple slices, raisens.. pretty much whatever finger food I had in the house… that way they got a break from sandwiches everyday..
Or try a tortilla rollup… with pb&j or ham and cheese or even just fruit?? Those are darling…but I never like to put effort in making food LOOK good, just TASTE good! .-= Ronnica´s last blog ..Happy Back-to-Schooling! =-.